The annual OTB Trivia and Auction Night will be held on Saturday 2nd June 2018 at 6:30pm for 7:00pm start in the West Lounge. 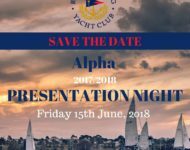 This event is a major fundraiser for the Junior Elite Sailors fund, and assists our Cadet Worlds team who will be competing in the World Championship in Germany later this year. Guests to bring their own nibbles/food – drinks will be available to purchase at the bar.